espite being a multiple world champion, Jorge Lorenzo is quite possibly the most unpopular man in racing. 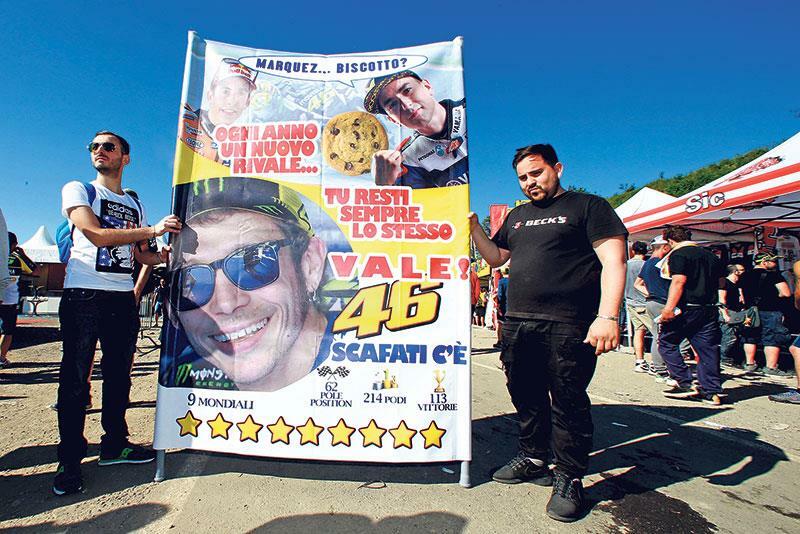 Disliked by fans, misunderstood by the paddock, the 29-year-old Spaniard has become the pantomime villain to the overawing force that is Valentino Rossi. Yet when you actually bump into the five-time world champion in the paddock or sit down with him for an interview, there’s a whole other side to him that emerges. Gone is the arrogance that many accuse him of, and instead you’re left with a friendly, funny, if sometimes a little awkward, guy. But despite how he is up close and personal, the hatred for him within the grandstands is palpable and has only increased this year, fuelled by the events of the now infamous Rossi/Marquez clash in Sepang last year and the fallout from it. For a lesser man, hearing the cacophony of boos every time he leaves the garage would be enough to dent even the biggest ego. But Lorenzo isn’t a lesser man, he’s the reigning world champion, a man in his prime and a man powered by a bulletproof mindset. Speaking exclusively to MCN, a headstrong and defiant Lorenzo said: “For me, being booed is a good sign! I would be disappointed if it was from fans who don’t support Rossi – but coming from them, it’s a good sign, because it means we’re beating him and getting good results. 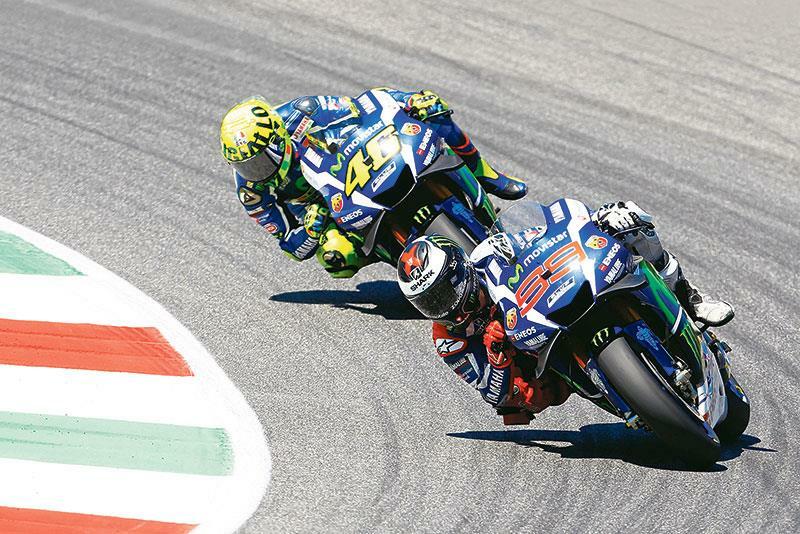 The tension between MotoGP’s loveless triangle of Rossi, Lorenzo and Marquez reached new heights at the recent Mugello race. So concerned were MotoGP bosses about safety at Rossi’s home round that both Lorenzo and Marquez were assigned burly bodyguards who were tasked with escorting the two Spaniards throughout the paddock all weekend. “You never know what you can find from 50,000 or 70,000 people though,” says Lorenzo. “You never know if there’s going to be one really crazy one. It’s better to take preventions, and Dorna have given bodyguards to me and Marquez. It shouldn’t happen though. It’s only happening with Rossi’s fans and he hasn’t stopped the situation. Moreover, while he might not get the respect he deserves from the crowds, the Spaniard is in hot demand from the factories – as was evident in the bidding war between Yamaha and Ducati that finally saw him switch to the Italian manufacturer for next season. And with Ducati finally winning the battle for Lorenzo’s signature that started all the way back in 2009, it’s clear how valued the super-smooth rider is within the paddock. But the switch to Ducati was about much more than money for the 29-year-old, who admitted to MCN that he needed a new challenge in a bid to continue his remarkable racing career. “The idea was to stay until the end of my career with the same brand,” he said. “It was more romantic, the idea that doesn’t normally happen in this world. But deep inside of me, I needed a new challenge, something that makes me wake up in the morning fully focused and to arrive at my highest level as an athlete. There was one other important consideration in securing Lorenzo’s move to the Italian firm; the chance to be reunited with an old friend. Last working with Ducati racing boss Gigi Dall’igna in his Aprilia 250GP days, Lorenzo admitted that the chance to once again work with the man who has revitalised the Ducati Desmosedici was a key factor in influencing his decision to finally make the jump. “I think without Gigi going to Ducati it would have been very difficult,” he admitted. “He was the key, he gave me the confidence to understand that it was the right moment to move. I’ve been close in the past, especially in 2009, but I didn’t do it and I think now is the right time to try this difficult challenge. If now we finally get good results it will all have been worth it! “It’s not an easy bike, if it was, they’d be winning every race. We have a lot of work to do, but there’s clearly great potential and a lot of strong points. It’s going to be a nice challenge for me. He will also get the chance to work with another familiar face from his 250 days next season in the form of team-mate Andrea Dovizioso. Adamant that he played no part in the decision of Ducati management to keep Dovizioso over Andrea Iannone, Lorenzo is nonetheless keen to be working with the Italian next year. “Dovi and I aren’t intimate friends, but I respect him and he respects me. He’s always been a very smart guy, logical and a good test rider, so he’s going to be a big help for Ducati too. But before he makes the switch to the red bike, there’s still the small matter of defending his title in 2016. Starting the year strong, despite a mistake in Argentina and being wiped out by an overzealous Iannone in Barcelona, he’s been his customary fast self so far this year. But, with Valentino Rossi and Marc Marquez both seemingly reinventing themselves this year to deal with the challenges of new electronics and the return of Michelin, Lorenzo admits that there’s still room for improvement in his own riding. “I’ve always had good concentration; it’s always been one of my strong points. But I’ve even improved it during the past few years and I feel that I am getting better and better. When I started in 125 or 250, I lost concentration and crashed all the time, but that happens almost never now. “To make one lap, maybe you don’t need that high concentration – but to do it for 25 or 30 laps you need to be able to. Don’t crash, don’t outbrake yourself in the corners, because losing one second in one corner might take 10 laps to recover. 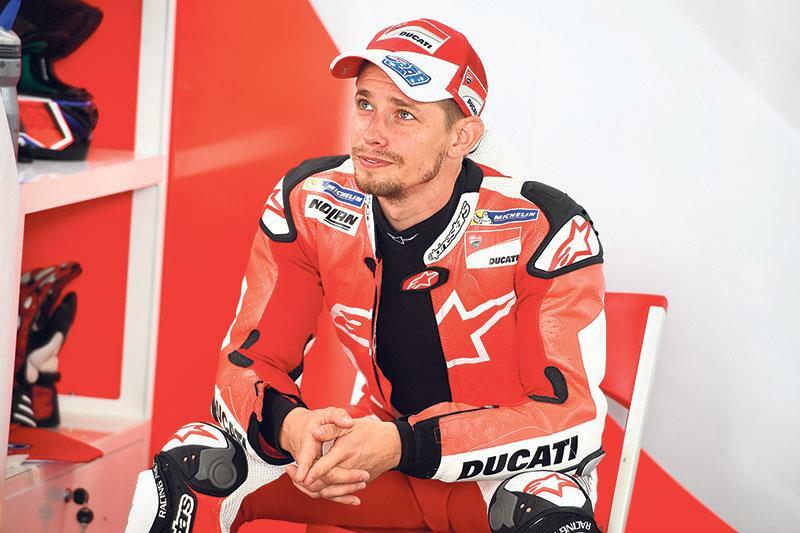 Jorge Lorenzo has one very important ally when he switches to Ducati – a man who knows what it takes to win on one; Casey Stoner. 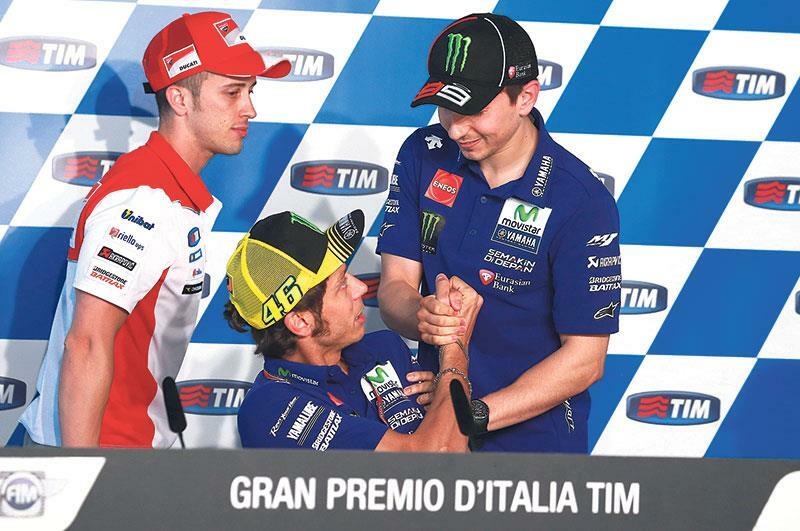 Lorenzo and Stoner are good friends, united by their passion to win and beat Valentino Rossi. Stoner is under no illusion of the challenge ahead for Lorenzo, but remains confident in the Spaniard’s ability to turn Ducati back into a winner. Stoner said: “Of course, at the beginning I think it’s going to be very tough for him after so many years on the Yamaha. It’s a very different machine and the Japanese and Italians’ styles are also very different. It will take a little bit of time to adjust, there’s no doubt about that, but we know Jorge and we know how he just keeps slogging things out.